This is a way lower cal version than your typical scampi. 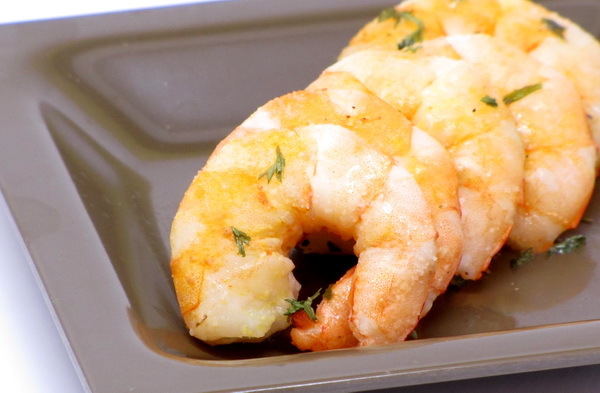 Instead of floating in a lake of butter, this shrimp dish takes the scampi flavor profiles and makes it well affordable in terms of calories 🙂 Use next to a pasta or rice dish (like paella) or use atop salads. Preheat oven to 350 degrees. Spray a baking dish with Pam. Lay the shrimp out without overlapping. Spray with the butter spray then sprinkle with a little bit of the Molly McButter. Finally sprinkle with garlic powder, salt, and parsley and bake 8 minutes or until done. Optionally sprinkle with just a bit of parmesan cheese just before serving.